REGISTRATION FOR THIS EVENT IS NOW CLOSED. To learn about other events and programs please click here. Enjoy a special afternoon of story time with award winning author and illustrator Todd Parr. Todd will read aloud and discuss several of his family-themed books, including The Family Book—a book that celebrates the love we feel for our families and all the different varieties they come in. With his trademark bold, bright colors and silly scenes, Todd’s books are designed to encourage early literacy, enhance emotional development, embrace multiculturalism and difference, and strengthen family relationships. For ages 3-7. This event will be followed by a Community Conversation with Todd Parr designed for young adults, parents and their friends. For more information, click here. 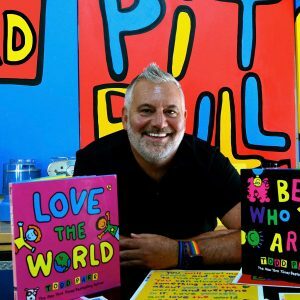 Todd Parr is the author and illustrator of more than 40 books for children, including the New York Times bestselling The I Love You Book, The Earth Book, and The Thankful Book. His books are available in over ﬁfteen languages throughout the world. He is the co-creator of the popular children’s television show ToddWorld as well as short ﬁlms for Sesame Street. Todd has partnered with Target, SF-MARIN Food Bank, Stouffer’s, People Magazine and several companies and organizations to help people, animals, and promote literacy. Todd’s books have won several awards and his TV show, ToddWorld, was nominated for three Daytime Emmy® Awards. Todd lives in Berkeley, California with his three adopted Pit bulls.